Lately, I've taken to cooking more, or attempting to anyways. It's a skill that you really do need for the remainder of your adulthood. As much as I love eating out, it's nice to know how to make meals you can enjoy at home. Since I am still an amateur, I stick to things that are pretty basic and don't take much time to make: appetizers, salads, soups and desserts. While I have succeeded in making some simple dinners, having dinner nights with friends is one of the best ways to learn to cook and to try new meals. It's fun to choose the recipes, split up the tasks, learn all at one, and then get to enjoy the meal you made together. The timing of making multiple things for dinner is always the challenge. 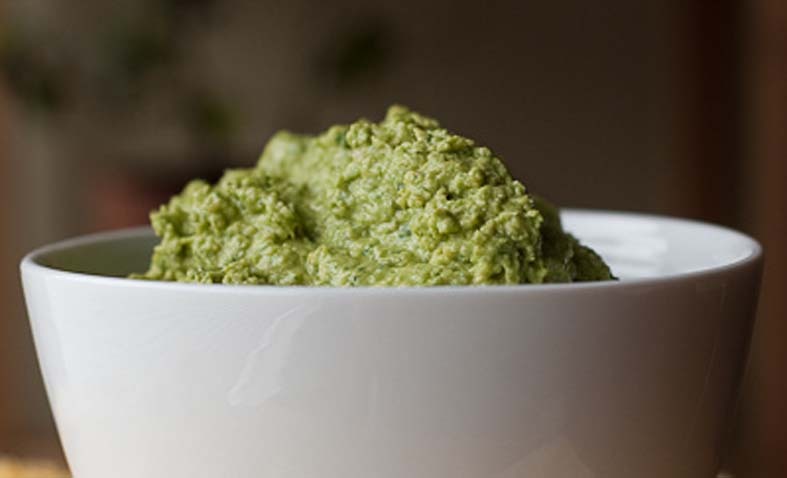 In a food processor add chickpeas, garlic and spinach. Pulse until combined, about 20 seconds (**it took me longer, stubborn spinach didn't make it's way to the food processor blades easily**). Turn off processor and scrape down the sides. Whisk together tahini, water, olive oil and lemon juice as well as salt and pepper. Turn food processor on and stream in liquid slowly. Once all liquid is added stop the food processor and scrape down the sides again. Taste and adjust for seasoning and pulse until fully combined. 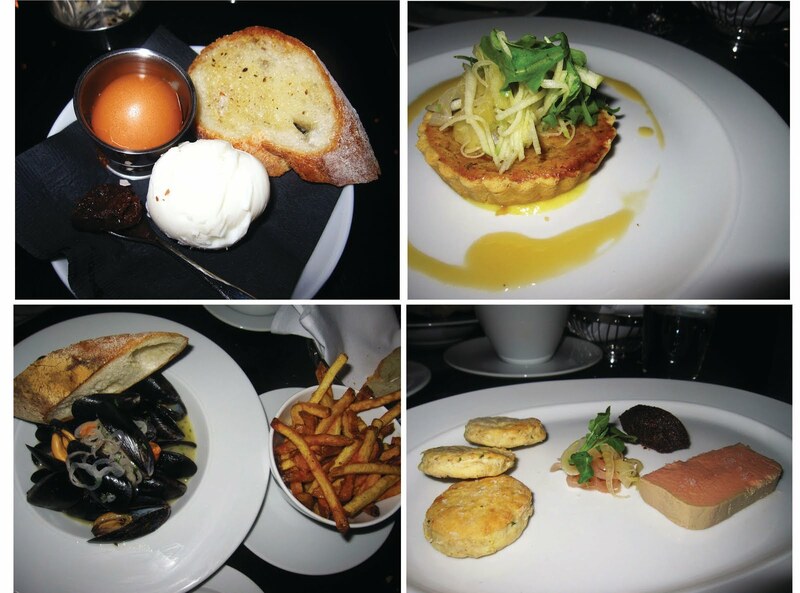 The Corner Suite Bistro is the restaurant child of Andre McGillvray (Lumiere, Chambar, Le Crocodile, Boneta) and Steve Da Cruz (The Whip, Chill Winston, Boneta, Gastropod). With Jason Liezert (who formerly ran Niche in Victoria) stepping in as their executive chef, after Anthony Sedlak (host of Food Network’s The Main) left just days before opening in February. 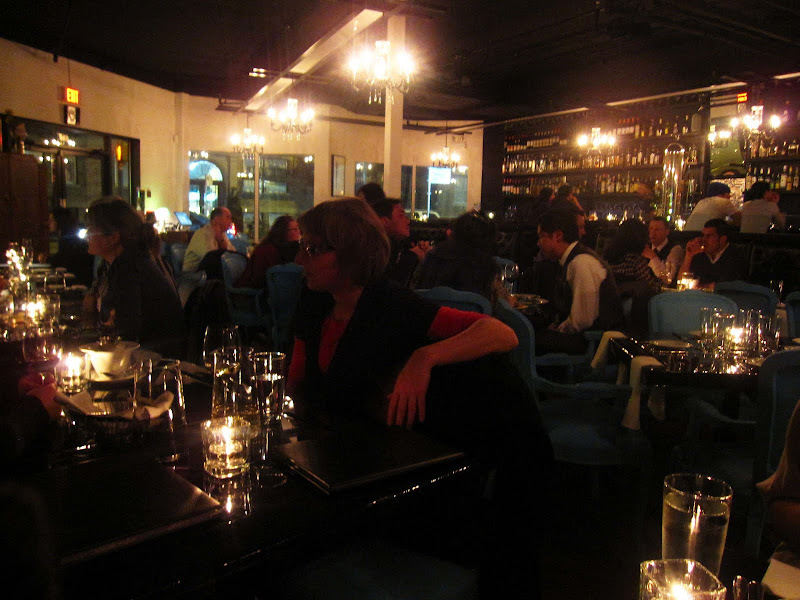 Located in the former Saveur location on the corner of Thurlow, where Smithe turns into Haro, it is a fairly sizeable french bistro renovated in black, with chandeliers and turquoise chairs as room accents. The room is open, with a raised 32-foot long stainless steel bar area along the back wall, dark wood tables and tufted leather booths; the atmosphere is warm and the staff are friendly and knowledgeable (we asked a lot of questions about the menu that night, I always like to know what the staff favourites or popular menu items are). My only decor qualms are that I can't say that I love the choice of turquoise, and that the windows need some sort of coverings, they seem a bit stark and cold, not to mention that my friend was blinded by car lights as cars made their way down Smithe. When seated, our server brought us each a cheesy, pastry-like puff; a tasty bite, and always fun to be offered something to nibble on. Next up, drinks. Searching through the binder (no joke) of drinks is a bit much. There are literally six pages of cocktails, not to mention the pages that cover their other drinks. It's too much, it would take too long to read if you were on the lookout for a new drink to try. I ended up asking the waitress, and she recommended the Russian Mule (I think that's what it was called): vodka, ginger beer, lemon, and mint, I believe; it was refreshing. My friend opted for wine. Foodwise, we decided to share the bacon & onion alsatian tart, sweetbreads, apple & fennel salad ($16, requested without sweetbreads), and I started with the DNEgg, a perfectly hard-boiled egg, truffle-buttered toast soldiers, bacon jam ($3), followed by the chicken liver pate, buttermilk toast, fig compote ($12), while my friend chose to have the mussels & fries, white wine, lemon, butter ($18). They also have a pretty extensive cheese menu. The server brought us bread with paprika olive butter to start. I appreciate it when restaurants make an effort with their bread and butter, whether it's a variety of bread or in this case, an enhanced butter; very nice. The DNEgg was a letdown, I don't really know what I was expecting…maybe it was the "truffle-buttered toast soldiers" that sold me, or the fact that they even had such a unique item on their menu to order. The egg was hard to peel (isn't that part of being a perfectly hard-boiled egg? don't you just need to place it in cold water after boiling it so that the shell comes off easier later? ), and there was only one toast soldier (there should be at least two, if not three; it's just bread), but the bacon jam was tasty, but so is anything with bacon. Not an item I would suggest ordering, unless you were really craving a hard boiled egg and toast for brunch. The bacon & onion alsatian tart made up for the DNEgg; fresh tasting, with a flaky, yet firm crust and a nice onion sweetened, yet salty, flavour to the filling. The chicken liver pate was nice and I really enjoyed the fig compote, which was a nice flavour contrast, texture compliment to the pate. Their choice of bisquits (and not the buttermilk toast as listed, although they could have been buttermilk bisquits) was a bit surprising, tasty, but bisquits in general make sort of a strange match for pate. I ate a lot of bread that night. My friend really enjoyed the mussels, saying they were comparable to Chambar's. In fact, she enjoyed the white wine, lemon, butter sauce so much that she finished it with her spoon; I dipped some bread (what else) into the sauce and will admit it was quite savoury and delicious. For dessert, we split the flourless chocolate torte ($8), which was actually really nice, and not too rich (forgive the messy photo, we were excited about it and dove in before remembering). And they didn't charge us for it, which was sweet of them. And to finish, they bring every table a plate of mini meringues, another nice touch (the waitress mentioned they used to hand them out in little cello bags, which would be a nice takeaway given how full we were at that point). Overall, it was a nice dining experience. 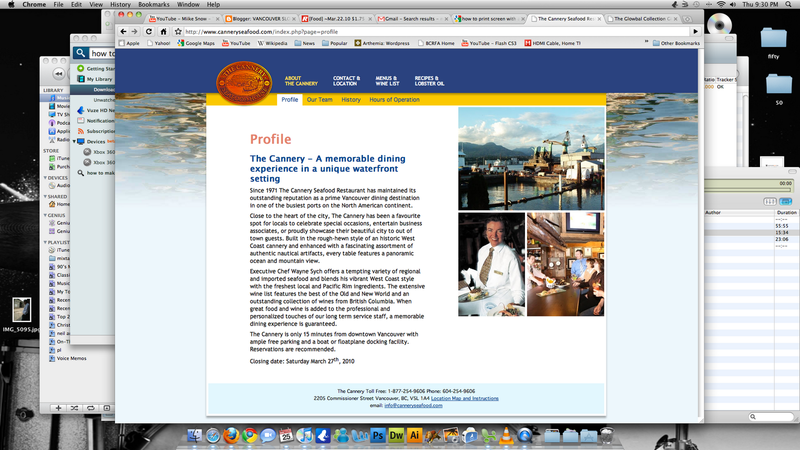 I'm not rushing to go back, but should the occasion occur, I would eat there again. The only other note we both had was that the bathroom was a) really, really warm, b) had different music playing than in the restaurant and c) was playing the music at a really high volume. 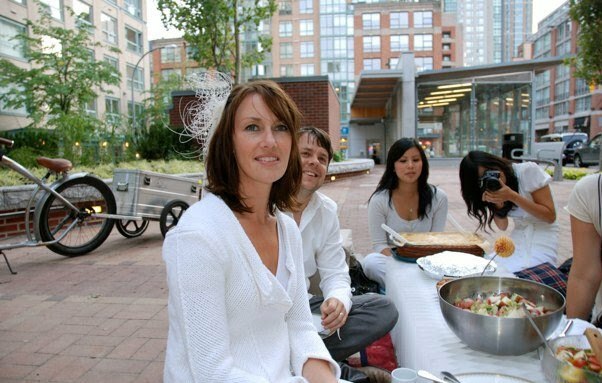 When Oru, the formal restaurant in the new Fairmont Pacific Rim, announced that it would feature a Pan-Asian menu, eyebrows were raised. The dubious concept brings horror to mind, with thoughts of chain restaurant menus looming in the air. 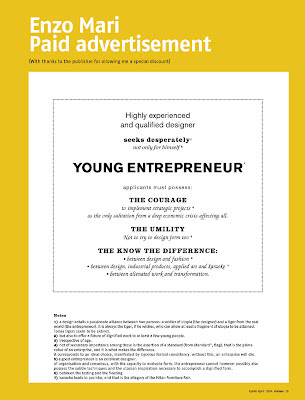 Tastes – palate wise and beyond – are questioned. Would this be an expensive version of the Cactus Club menu, featuring an overpriced Coles notes version of popular Asian fare? The menu is indeed comprised of various Asian dishes, cherry-picking from well-known Chinese, Japanese, Korean, Indian and Southeast Asian favourites. The server went to great lengths to inform us that even the service would reflect an “Asian” flair: dishes would be served whenever they were ready, instead of in a typical three course progression. Chopsticks are the default option; knives and forks available on request. The room features an impressive origami light fixture made by local master Joseph Wu. The message is presented loud and clear: if Oru is pushing the Pan-Asian concept, they’re going all out in doing so, guns a-blazing. 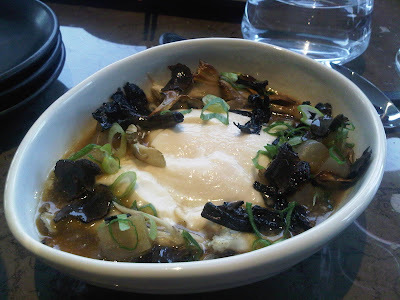 We started with the housemade tofu ($10) served with maitake mushrooms, Mongolian truffles and braised daikon in a thickened sauce. The tofu is a silken wonder, lingering in the mouth just long enough to savor its subtle flavour and breathed in shortly afterward, the sauce good but perhaps a bit lacking in salt. 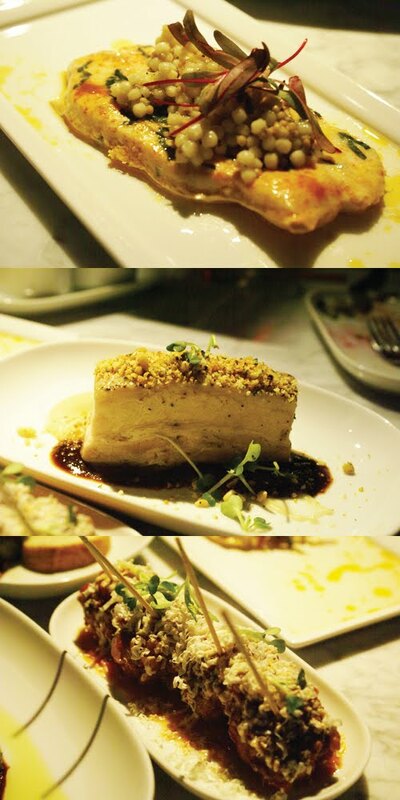 It’s not overly clear why this should be considered an appetizer on the menu (particularly given the server’s emphatic speech beforehand), the portion size masking how rich and filling tofu can actually be. 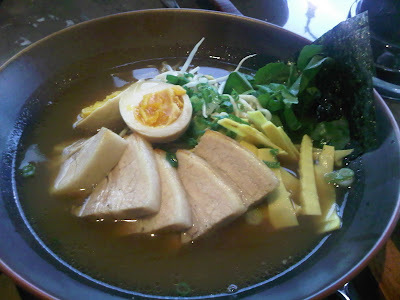 This was followed by the ramen ($15), served with housemade noodles, braised Berkshire pork belly, egg and bamboo shoots. The Straight’s Carolyn Ali has called this “easily the best ramen in Vancouver,” an exaggerated description given the city’s ever-increasing ramen options as of late. It’s good, not great: the noodles not quite toothsome enough, the broth not quite flavourful enough, with only the pork belly being noteworthy. 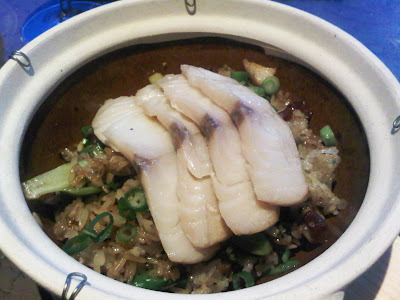 The smoked sablefish with claypot rice ($24) has similar problems. Though the sablefish in itself is fantastic, it doesn’t make immediate sense when paired with the lap cheong rice (nevermind the limited portions), and the rice in itself is no more than a good fried rice. Though served in a claypot, it hasn’t done quite enough time in it, and is without those crunchy bits of rice that make a claypot dish so enviable in the first place. Despite these shortfalls, it’s safe to say that Oru has avoided all the pitfalls of Pan-Asian kitsch: there's no sense of dumbing these dishes down in the same way chain restaurant menus might. If anything, one could easily argue that these dishes are more representative of a true, multicultural West Coast cuisine, reflective of an environment where these dishes are increasingly less exotic. There’s enough missing from Oru, however, that will garner the same criticism that has been laid on brethren-in-spirit Bao Bei. It may be a mistake to immediately compare these places to the traditional dishes from which they came, but it’s not a mistake to criticize both for not departing from those benchmarks enough. A modern context is sought and achieved; a modern product, not so much. Where Oru succeeds, then, is in the desserts. These take Asian flavour profiles and leaves the baggage in the dust. 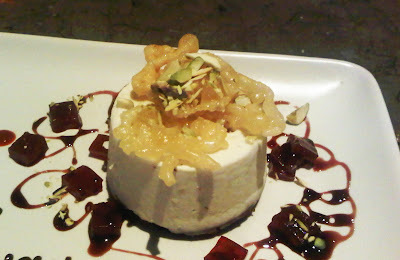 A jalebi sits atop a pistachio-cardamon kulfi ($7), pomegranate gelee cubes sprinkled all around. It hints at the traditional without being mired down by it, providing a glimpse of some undiscovered land to which the rest of the menu will hopefully emigrate. And if Oru intends to be the destination restaurant that it should be, it'll need to. I consider most of the ramen spots (Motomachi, Kintaro, Menya, and Benkei) in the city to be good but none of them blow me away. Ippudo is still my barometer for ramen, and nothing has come close to that. A friend told me about a new spot on Robson called Santouka so I decided to check it out. 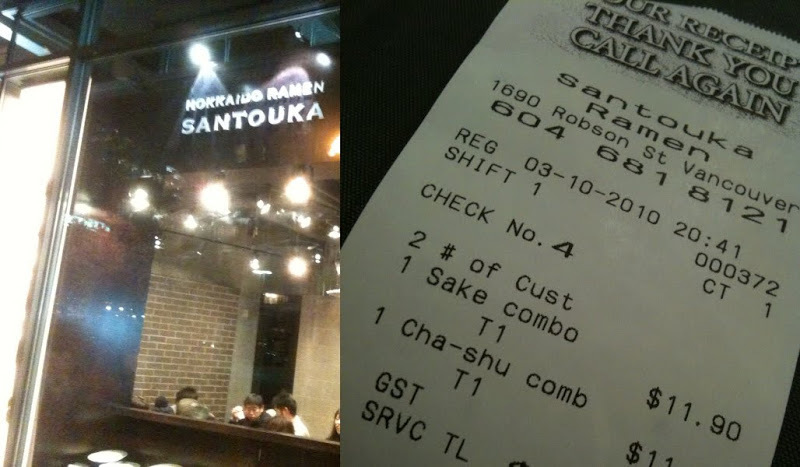 Doing a bit of Internet research, Santouka is actually a ramen chain which has locations in Japan, California, HK and other cities in Asia. We walked in on a Wednesday night and I was very surprised to find the place busy. Not bad for such a new restaurant. The atmosphere was nice, with a window spanning across the kitchen so I wouldn't get splattered by broth or more likely put in place so I can watch the cook making my bowl of soup. I really like being able to see the kitchen, it comforts me knowing that I can see the dude if he sneezes in my soup. The menu was simple, showcasing a few different types of ramen (shiro, shoyu and tonkotsu). What really intrigued me was they have limited servings of pork jowl. They were already sold out but this is something I really want to go back and try. I ordered the shoyu ramen combo for $11.90 which came with a small ramen topped with fish cake, seaweed, kelp, 2 pieces of pork and green onions, a small bowl containing half a boiled egg and pickled cabbage and a side of bbq pork on rice. So how did it taste? I really enjoyed the flavour of the shoyu (soya sauce) broth. I found it to be a touch rich with a slight earthy taste. It has been a while since I have been to Kintaro, or Motomachi but I think this broth is be better. The noodles which came out of a package were just okay to me. Overall, this ramen spot stands up well with the competition. 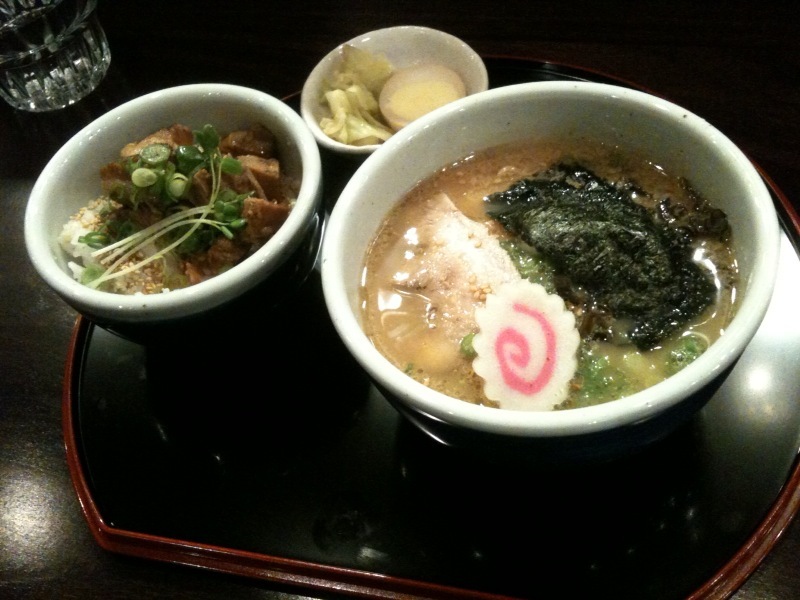 It sells for a similar price comparable to Menya, Benkei, Kintaro and has a great broth. I plan on returning to try the pork jowl. Just up the street from Guu Garlic. Oh if you want to watch something funny/stupid here is the trailer for Ramen Girl. That might set an unwelcoming tone for Giovane, but the place is thankfully low on pretension and high on carbs. It’s primarily a soup and sandwich place, with pizzas, pastas and pastries to boot, but with a level of refinement you’d expect in a high-end hotel. This is good news for the downtown lunch crowd, particularly those bored with Sciue, which is only a hop/skip/jump away. The pizzas aren’t quite as novel, but the capricciosa pizza ($9) we ordered – served with artichoke, prosciutto and slices of hard-boiled egg – was no slouch either, just as tasty and large enough for two having a light meal. The paninis, however, are more accomplished, each served on house-baked bread. The porchetta panini is served with braised pork, shaved fennel, and fontina cheese; the positana panini features grilled eggplant, chabichou cheese and pickled shallots. We had this as part of a combo ($12) with the mushroom soup, rich with portobello and cream, and probably one of the better versions in town. Giovane makes its own pastries as well, which were the highlight of both our visits. There is a fair assortment of cakes and tarts, each of varying price and cream content. We had the hedgehog ($8), a diabetic’s best chocolate and peanut-butter nightmare. As great as it was, the true star is the simple sugar bun ($4), light and fluffy, filled with vanilla cream and coated with confection sugar. Given the high price point, many may turn away, and I don’t know if Giovane offers up the utopia and assertion of standards that the Enzo Mari poster speaks of (to be fair, I'm not sure that anywhere does). Those willing to pay extra for a bit of polish, however, will find it well worth it. Every once and a while after soccer I will eat at a gas station. 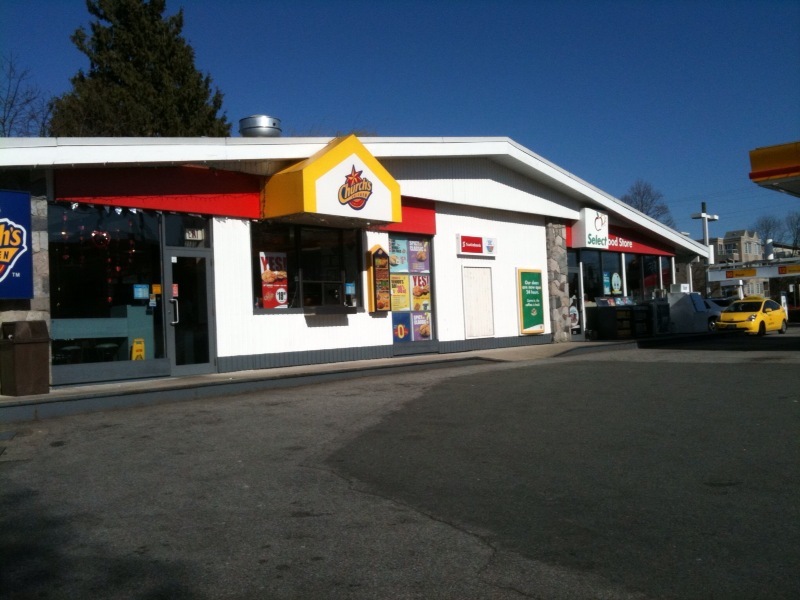 There is a Church's at a near by Shell and there are White Spots at the occasional Chevron. I often ask friends and they usually state they rather not eat at a gas station. I understand it but I am interested to see how wide spread that feeling is. My friend and I had a meal and discussed why there are soo many Filipinos working at Church's. I figure they like the food and they bought into the franchise, my buddy just things they like the food and it is an ideal high school job to have. I prefer Church's over KFC, there is something about that skin. 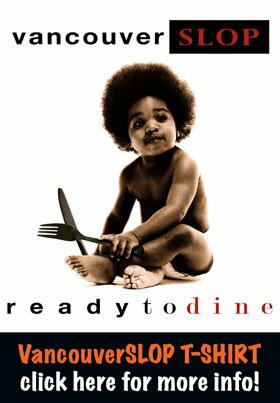 And if you eat it like I do, you get take out (chicken, fries and gravy), make a few cups of white rice at home and chow. I like to wrap my chicken skin around fries, and rice and dip that in gravy. So damn good and the only way to eat it if you ask me. This time we had no rice and just had to dip the skin and fries. You might think this is a lame post until you try eating your rice, with fries, wrapped by Church's chicken skin and dipped in gravy. You can thank me later. Oh anyone been to Ezell's in Seattle? If not, google that before your next trip down. There’s a tremendous lack of Spanish fare in Vancouver. Café Barcelona, which serves up tapas and pintxos on Granville Street downtown, fills that void somewhat, and thus it’s easy to gloss over its many deficiencies: you take what you can get. 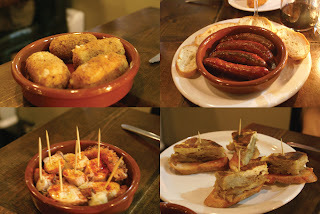 The place is not without its charm, and recalls the casual breeziness of many neighbourhood tapas bars in Spain. Here, then, are your obligatory selections of olives, seafood and jamon in a variety of shapes and forms, supported by a limited assortment of Spanish wines and beer (along with your local choices). It’s impossible to overemphasize the importance of alcohol in any tapas outing, and with the view looking out towards the Granville Street nightclubs, it’s hard to forget its importance at Café Barcelona too. From there it went downhill. We ordered a crème Catalana, a Spanish riff on crème brulee, which had a chewy, sugary mess on top, covering an overly liquid crème that was warm in some patches and cold in others. This provided a good summation of the bipolar service, with one server pleasant enough, the other dour, forgetful and just plain absent. Taken together with the average fare, Café Barcelona isn’t a place to rush back to. If it wasn’t for the city’s slim pickings for traditional Spanish fare, it probably isn’t a place to rush to in the first place. A quick note for those in need of a warm pastry: Bonchaz, previously sold in local markets here and there, has opened its first standalone location on W. Hastings downtown. Their namesake speciality, the bonchaz, is a take on the Mexican 'concha,' which tastes a bit like a brioche topped with a Chinese pineapple bun crust. (Sandwiches, soup and other things are available too, but ultimately inconsequential.) 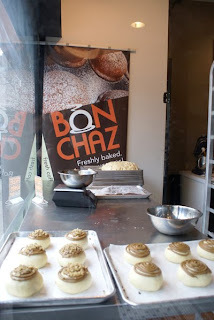 The bonchaz comes in three flavours (original, banana walnut, and mocha) but go with the original if it's your first. Light as helium, the buns sit warmed in the oven until you order - they might float away otherwise - so make sure you get one that's not burnt (one out of our three were), and eat it before all that lovely warmth fades away.